As President and CEO, Brenda’s philosophy was simple: “I love creating cosmetic solutions for my clients, making a real difference, elevating their self esteem. That’s what it’s all about for me. It is my passion! I thrive on creating a product to meet a specific need for one of my clients. However, what I enjoy most is sharing the solutions and teaching. It does not matter whether it is another professional aesthetician, a makeup artist, a physician, a model, an actress or one of my private clients”. 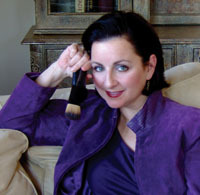 In the fall of 1984, Brenda Christian Cosmetics expanded into a sourcing company for professional makeup artists. Brenda Christian Cosmetics enlarged its presence in the market with the creation of Brenda’s “flagship” product. The Perfect Brow® system was developed giving its user eyebrows that really looked fuller and very natural. This one color Universal Brow Definer pencil uses the pH in your skin to adjust its color to your own natural eyebrow hair color. The recipient of the international “GLAMOUR” Gold Award and a recipient of the London Times “Top Ten Products to be Imported into Europe”, Brenda’s Perfect Brow system is unparalleled within this industry.